Went to Hurstville Civic Theater to watch The Queen. The movie runs for an hour and a half, but it feels much shorter than that because of the fairly straightforward plot. The movie is set in 1997 right after Tony Blair's election as the first Labour Prime Minister in 18 years. Jump to a few months later when Diana and her friend Dodi Al-Fayed figured in a car crash in the Pont de l'Alma tunnel in Paris while being chased by paparazzi on motorcycles, which resulted in their deaths. People all over the world, especially the British public, were shocked. People came in droves to Buckingham Palace, leaving flowers and gifts at the gate. Blair read the pulse of his constituents pretty accurately. He immediately issued a statement, calling Diana "the people's princess, beloved by the world." He got lots of brownie points for that one. Meanwhile, the Queen and the royal family were holed up in Balmoral Estate - far from the madding crowd. Following protocol, the Queen didn't issue a statement. No half-mast flag at Buckingham Palace. No public funeral as Diana's not HRH anymore after the divorce. Things took a turn for the worse. Day and night, more and more people came to Buckingham Palace to express their grief, and they're starting to get disgruntled with the Queen's indifference. Some even starting calling for the abolition of the monarchy. Alarmed, Tony Blair makes an appeal to the Queen to reconsider. The Queen is caught in a bind - on one hand, Prince Philip and the Queen Mum have been telling her to stick to her guns and stand her ground no matter what the public says; on the other hand, she feels she's getting out of touch with the times and her people, and this might be her last chance to set things right again. Left with no choice, she followed Tony Blair's advice and came down to London with the family. A royal funeral was also arranged for Diana - patterned after Operation Taye Bridge, which is supposedly planned for the Queen Mum. 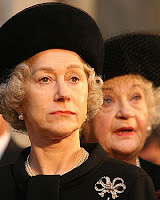 Of course, Queen Elizabeth's not too happy about that. The Queen appears on live TV and gives a speech praising Diana's many contributions to the world. At the end of the day, all is well again in the kingdom. 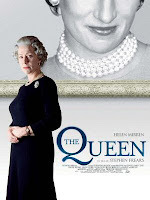 Very authentic portrayal of the Queen by Dame Helen Mirren, even though I've never seen much of the Queen myself. If ever the royal family needs someone to stand in for the Queen for some boring social event, they definitely should give her a call. I went home after the movie to find the front lawn nicely mowed and the thick grass under the metal fencing neatly trimmed. Turns out the neighbor saw the sad state of our front lawn and asked my mom where I was and if she needed help with the mowing. Before she could answer, he went to get his gear, came back, and did the work. It was all finished by the time I got home. Thanks, neighbor. I owe you one.